Cupcake, my love: Fairwell to Summer! The end of summer is upon us :( And I thought it would be best to have one last go round at the wonderful fruity desserts that are only possible in summer. 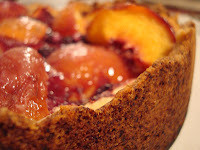 I found this recipe while poking around Epicurious.com. The minute I saw it my entire mouth began to water. 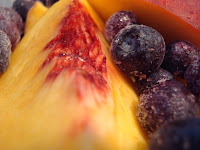 Just looking at the juicy peaches and bubbling blueberries made my mouth cry out for a bite!! Sometimes when I look at a picture of a beautiful dessert I can almost taste the melding of the individual flavors in my mouth and practically imagine myself taking the first bite, of what I am sure will be my daily moment of eternal bliss...that's what the pictures of this "cake" did for me! 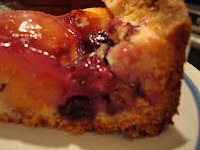 I could not believe how easy this Peach Blueberry Cake was to make, and can I just say, I think it's funny that it's called a cake, because it didn't really seem like a cake to me. 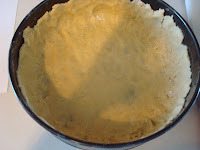 It's more like a fluffy, moist pie crust/bready type of thing (ok, that wasn't any help...no I see why they said "cake"). The only change I made to the recipe was to exchange cornstarch for the tapioca pudding. Next time I make this though I will either add a little extra corn starch or try the tapioca, because I wish my fruit sauce/juice would've been a little thicker. The thing I loved most about this was that it was mostly fruit. 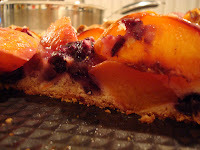 The peaches are cut into quarters, so you get huge chunks of them, and the crust wasn't too overwhelming. Everything was balanced out perfectly. (Oh, I also added a little less sugar to my fruit, since they were already soo sweet). 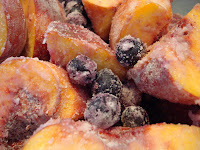 And even though this recipe is "summer based" I think it could easily carry over into the off season, thanks to the frozen foods section :) I'm interested to see what this recipe would be like with different fruits...maybe plums and strawberries, or peaches and raspberry...even rhubarb. I mean the possibilities to this easy to prepare masterpiece are endless! The presentation is also AMAZING, like I said...how can you not want to eat this after you've seen it. It was so funny, my mom was out mowing the yard and came in begging for me to take it out of the oven for her to have a bite because she could smell the alluring aroma outside!! 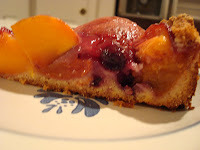 And I will admit this cake smells heavenly, the smell of sweet peaches bubbling away in their own juices, with a slight aroma of plump blueberries in the background is enough to put anyone in a trance! So take caution when making this, because you will fall head over heals for this cake in no time flat!! I don't think words can describe to you just how scrumptious the first, second, third, fourth...last bite of this cake was. 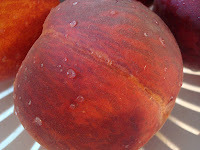 The peaches had softened, of course, but still held up very nicely. 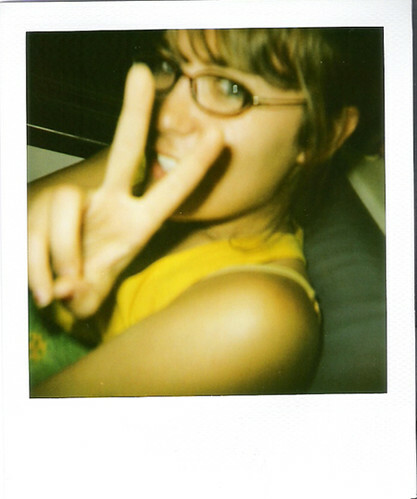 They didn't turn to mush, they had only gotten sweeter with each passing minute of the oven timer. 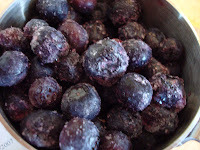 And the blueberries were cooked perfectly to the point where they would burst in your mouth when you bite into one. 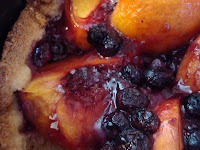 Then there was the thick syrup that formed from the natural juice of the fruit, which was almost like a stewed fruit/compote mixture, which lended just enough moisture to the crisp on the edges, but fluffy in the center, crust! I am telling you, I haven't enjoyed eating a dessert like this in a really long time!! 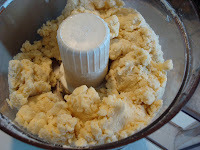 Make pastry:Pulse together flour, sugar, baking powder, and salt in a food processor until combined. 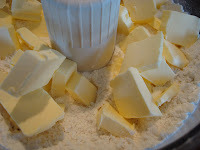 Add butter and pulse just until mixture resembles coarse meal with some small (roughly pea-size) butter lumps. 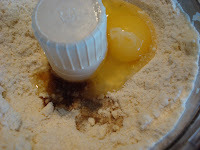 Add egg and vanilla and pulse just until dough clumps and begins to form a ball, about 15 pulses. You have great blog. Would you mind to have a link exchange with me? I have not received confirmation from you concerning our link exchange. Saw your blog for the first time tonight, and had to say, I think that this looks yummy! When I was in Germany a few years ago, I had "kuchen" and it was sort of like this, kind of a hybrid between a pie and a cake. My great grandfather was a baker in Germany and immigrated to this country around the turn of the last century. He never could make a good pie, because pie crust was foreign to him. The German equivalent might have been more like what you made. In any case, super yummy! Thanks for sharing it!